These had been suggested by citizens on March 28, when more than 70 people turned out at a meeting called by Friends of Calls Creek to voice their concerns about running a 24-inch pipeline from the county’s wastewater treatment plant just outside Watkinsville down the creek. 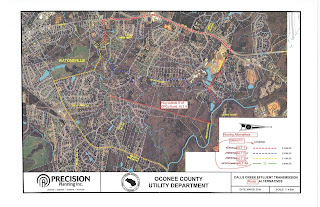 A fourth route along Spartan Lane was not suggested at that meeting but was included in a message Jimmy Parker from Precision Planning Inc. sent on April 1 to Oconee County Utility Department Director Wayne Haynie. Precision Planning, with offices in Monroe, is doing the survey work for the county on the proposed Calls Creek gravity feed line. These lines and variations of them were a focus of a meeting Friends of Calls Creek held Thursday night that was attended by about 50 people, including Athens attorney John Baker, who is representing Friends of Calls Creek in its efforts to keep the pipeline out of the creek. Representatives of the group plan to attend the Board of Commissioners meeting tomorrow night to show again their opposition to county plans for a pipeline down Calls Creek. Baker circulated the email from Parker to Haynie regarding the four alternates to a small group of people, including me, before the meeting on Thursday night. He discovered the email and attached rough draft of routes in materials obtained through a series of open records requests made by Barb Carroll and others. Carroll, 1080 Holly Point Way, has been one of the most outspoken critics of the county’s plans. Parker, who attended that meeting on March 28, asked Haynie in the email if Haynie would like a cost analysis for each of the “three proposed ‘pump’ alternatives.” The map attached actually included four alternate routes. The four are labeled as pump alternates because they rely on pumps to get the treated wastewater at least part of the way to the Middle Oconee River, while the pipeline down Calls Creek relies entirely on gravity, which is cheaper. Haynie told me last month that he is expecting a report from PPI early this month on alternates to the Calls Creek line, but he did not indicate what routes were being considered. Much of the attention at the March 28 meeting had been on use of the Georgia Power Company easement, which largely crosses undeveloped land, and along Simonton Bridge Road. Parker only drew a rough line on his map indicating where the pipe would run relative to the power company easement, but he provided more detail for the Simonton Bridge Road, U.S. 441 and Spartan Lane routes. The Simonton Bridge Road and U.S. 441 routes would mostly skirt developed neighborhoods, while the Spartan Lane route would run along roads in developed residential areas. Both the U.S. 441 and Spartan Lane routes would follow Rockinwood Drive east of Athens Academy and then run behind Cherokee Circle to reach the Middle Oconee River. 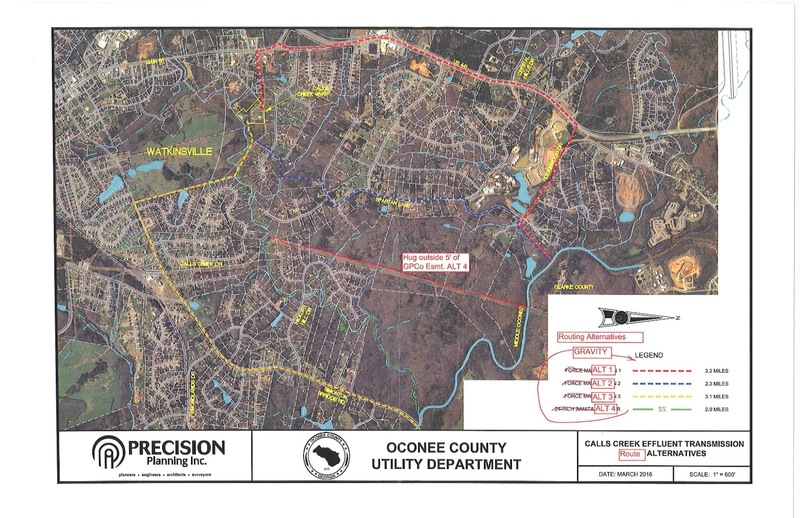 The county already has easements for a sewer line providing service to the Athens Ridge student housing complex and the Falls of Oconee commercial development on Old Macon Highway as well as to Athens Academy. The county pumps sewage via this line up from McNutt Creek to another pump at U.S. 441 at Athens Academy, and from there to the high point along U.S. 441. From the high point the sewage flows via gravity to the Calls Creek plant behind the fire station on North Main Street. The county could run another line along that same easement and pump treated sewer water from the plant to the high point on U.S. 441 and then allow it to flow via gravity to McNutt Creek. The county would have to obtain easements to get the treated sewer water from McNutt Creek to the Middle Oconee River, since the county holds waste load allocations for discharge into the Middle Oconee River but not into McNutt Creek. Tony Greco from Friends of Calls Creek outlined that route at the meeting on Thursday night as well. I identified that route based on recent zoning documents for the commercial development in front of Athens Ridge and passed that information to Greco. I could not attend the meeting on Thursday discussions. Sarah Bell attended and has recorded the meeting, and I will upload that video as soon as possible. Bell provided me with a summary of the Thursday evening discussions. The Commission meeting tomorrow night will include four items dealing with water and sewer projects. The first is a task order with Precision Planning for design of McNutt Creek Sewer Connector, Phase II, in an amount not to exceed $27,850. The second is a task order with Barge, Waggoner, Sumner & Cannon Inc., Peachtree Corners, for upgrades to the Oconee Veterans Park pump station and force main, in an amount not to exceed $93,006. The third is a task order with Precision Planning, Inc. for design of a new water tower in an amount not to exceed $97,850. The fourth is a bid award for a shared project with the City of Bogart for sewer system improvements for a total amount not to exceed $875,374. Oconee County’s share is not to exceed $475,419. All of the projects are to be paid for with Special Purpose Local Option Sales Tax funds. Citizens should be given a chance to comment on each of these contract as well as on issues not on the agenda during the citizen comment section at the front of the meeting, which states at 7 p.m. at the Courthouse in Watkinsville. The BOC also will hold a public hearing on the Fiscal Year 2017 Budget, and that will require the commissioners to allow public comment. The Commission also will hold hearings on four rezone issues. The Board of Commissioners has instituted a new policy that will impose a three-minute restriction on comments. A timer appears on a screen and then rings when the speaker exceeds the allotted time. Good to see there are options. I agree with a time limit to squelch speeches, harangues, and polemics. Three minutes is just right to prevent good detail, of course. The limit should be five minutes. A better limit is number of redundant presentations.